TOKYO KIMONO RENTAL TANSUYA closed on 30th Novermber. We will sell the reused KIMONO.And we will continue the kimono rental shop. We will move to the Kanda-myoujin shrine.We will change our name and open on 15th Dec.2018at B1 of BUNKA-KOURYUUKAN building in Kanda-myoujin shrine. About the reservation after 15th Dec.2018, please ask us by the e-mail. All plan are include all you need to wear KIMONO. 10月1日からは着物プラン！10月1日開始變成和服方案!It's change to Kimono Plan from 1th October! TOKYOきものレンタルたんす屋の浴衣プランは、 9月30日まで、10月1日から着物プランになります。 ++++++++++ TOKYO和服租借TANSU-YA的浴衣方案只到9月30日喔! 10月1日開始會換成和服方案! ++++++++++ TOKYO kimono rental TANSU-YA's Yukata plan is until September 30. 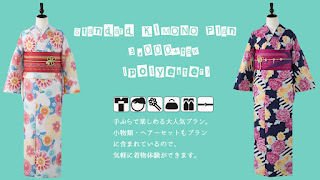 It will be change to kimono plan from October 1. ６月5日からは浴衣プラン！６月5日開始變成浴衣方案!It's change to YUKATA Plan from 5th June! TOKYOきものレンタルたんす屋の着物プランは、 6月4日まで、6月5日からは浴衣プランになる予定です。 ++++++++++ TOKYO和服租借TANSU-YA的和服方案只到6月4日喔! 6月5日開始會換成浴衣方案! ++++++++++ TOKYO kimono rental TANSU-YA's Kimono plan is until June 4th. It will be change to YUKATA plan from June 5th. 5日以降に予約される方は、お手数ですが、 着物プランを選択した上に、 メモのところに「浴衣希望」とご入力ください。 （予約ページは5日以降に着物プランが選べるようになります。） ※値段が変わります※ 値段はこちら ++++++++++ 想要預約5日以後的客人請注意， 預約的時候選擇和服方案後，在備註的地方寫上「浴衣方案」， 讓我們知道客人要預訂的是浴衣喔! ※但請注意價錢會變動※ 價格請參考此處 (預約網頁預定在5日以後可以直接選擇浴衣方案) ++++++++++ If you want to book after 5th June, sorry to trouble you, please select kimono plan, and enter a"YUKATA plan" at the memo.